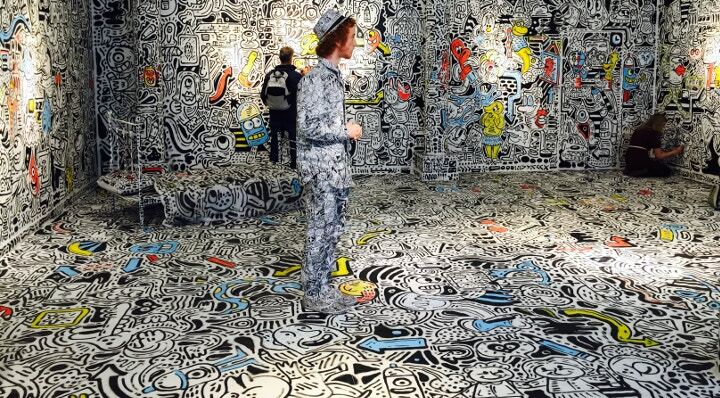 Doodle Man, otherwise known as Sam Cox, confesses he has OCD - Obsessive Compulsive Drawing! 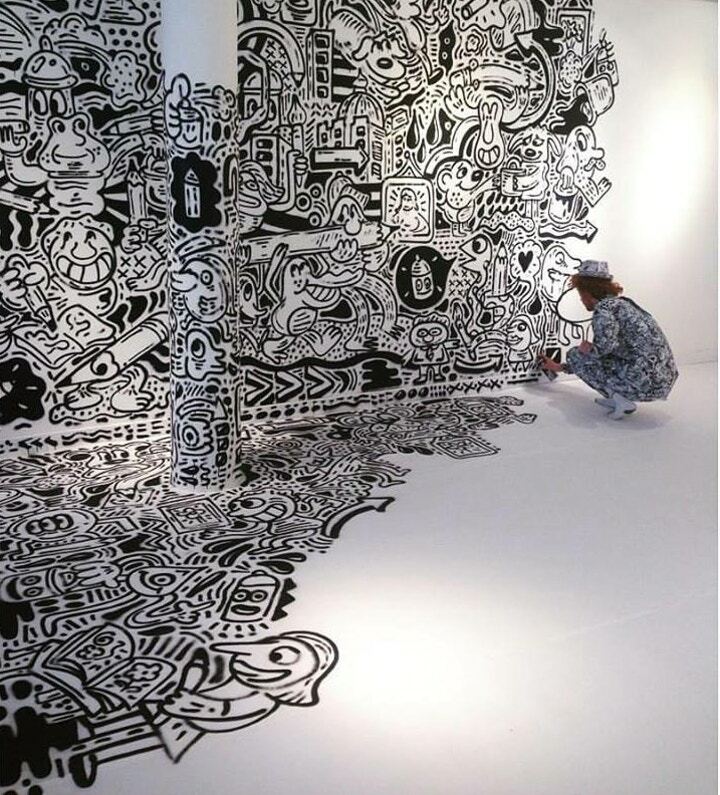 An artist from Kent, Sam doodles consume many different surfaces, including walls, floor and furniture, spreading beyond the sketchbook and infusing spaces with his bustling drawings. He has produced work for brands like BBC, Pepsi and Adidas, and the exciting news is that he will be doodling over The Art Space at Cass Art Glasgow this month. Go along to meet him and colour in his drawings. We caught up with Sam to find out more about his work. How did you first get into doodling and is it something you would encourage everybody to do? My love and obsession with doodling has grown since I can remember. I use to love copying the cartoon characters on cereal boxes, TV animations and video games. Some of my favourites were Crash Bandicoot and Wacky Racers. I would initially copy these characters and then twist them to becoming my own creations. Eventually I'd begin making comics about teachers at school and share them with my friends. I was also very much influenced by graffiti, hip hop and hieroglyphics as I grew older. This all built in to creating my Doodle Man style! I would encourage people to create something. It doesn't necessarily have to be doodling but doing something creative is really fun. What's your inspiration behind the work you create? My inspiration behind my work visually stems from early cartoons, hieroglyphics, myan art and graffiti. Also, busy scenes such as the 'Where's Wally' books by Martin Handford as well as artists such as Hieronymus Bosch. I take other inspiration from things like supermarkets as I like seeing all the products mashed up next to each other, it's visually exciting. I also listen to video game soundtracks while I work as they can inform my character expressions. With comics being hugely popular, do you think there's a hunger for artists to take up their pens now more than ever? I think that there's hunger for more people to want to draw than before because art is becoming increasingly more accessible every day due to the tools that most of us now have. To not only research art online and digest a lot of content, but also to present our work through capturing it on a phone and then positing it onto the internet. However, whilst it's easier to share something, it can also be harder to stand out as there's so much information. Scotland has a rich tradition when it comes to comics and drawing, why do you think Scots are so good at it? I don't know too much about Scotland's rich tradition in comics and drawing as I live in Kent, England. But I can say that after staying in Glasgow for a few days whilst working on this project that the architecture is brilliant and the city as a whole is visually exciting to look at. So perhaps some of the reason Scotland has a rich drawing background is due to the inspiring surroundings. What are your hopes for this project and what have you done to prepare for it? My hopes for this project are that people who come into the space enjoy what they see and are excited by it. I would like people to have fun exploring a drawing that you can not only look at but actually walk into also. I also hope that it helps lead to other projects because drawing is my favourite thing to do and I love murals, the bigger the better so it hope to paint a load more! Sam Cox exposes his alter ego in his video "The Doodle Man". See The Doodle Man working live at Cass Art Student Day in Glasgow. Find out more about Sam Cox's work on his website.